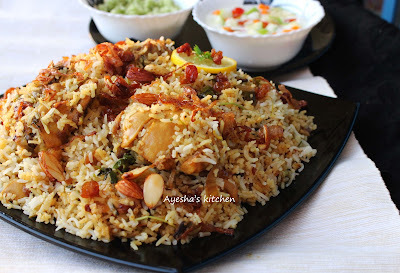 Until I try this rice recipe (Thalassery biryani recipes), I felt that it is almost same like Malabar dum biryani and Hyderabadi chicken biryani. But now it has changed. Each Indian rice recipes are quite different in taste, flavor and the way of preparation. For sure, this won't come under quick rice recipes but it is worth enough for those who need delicious finger licking good rice dishes for dinner/lunch. Thalassery, a region in Kerala (India) is known for its biryani. 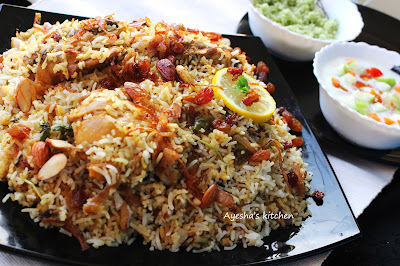 Thalassery biriyani is a rice based dish blended with spices and chicken. 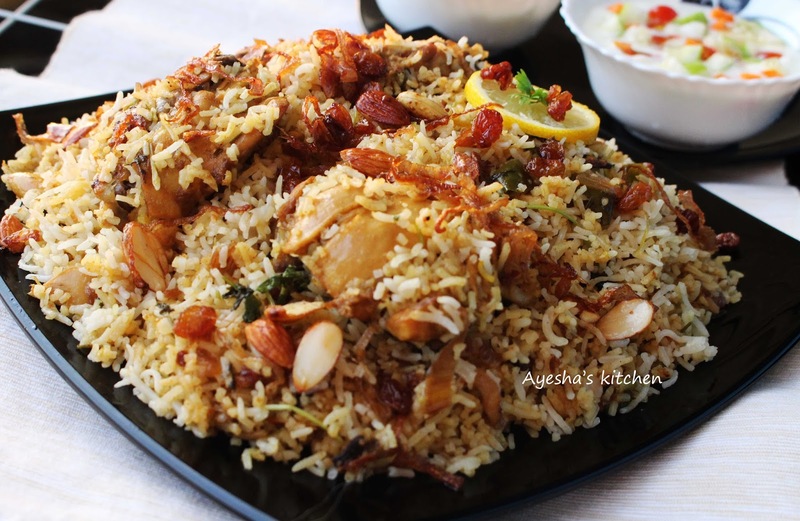 It is the popular biryani recipe in Kerala cuisine and so it is called as Kerala biryani. This dish is a traditional Malabar cuisine (one of the non-vegetarian cuisines in Kerala). 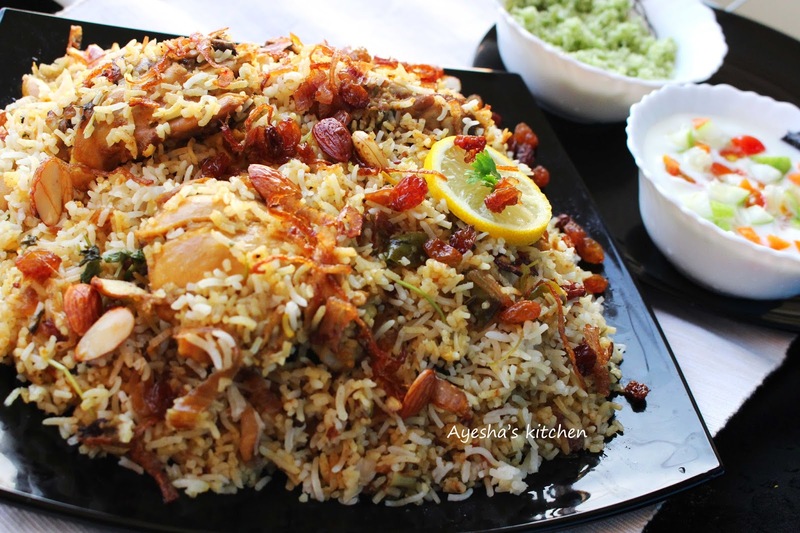 In Malabar, biryani is served in each and every special occasions. Do try this scrumptious thalassery chicken biryani recipe. Here is the recipe with step by step pics showing how to make chicken biryani/biryani recipe rice /biryani chicken recipe / thalassery chicken dum biryani. Clean the chicken pieces well and pat dry. Marinate the chicken pieces with half tsp of turmeric powder, half tsp of chili powder and salt. This is optional only but I prefer marinated chicken for making biryani masala. When done, set aside. Fry cashews, raisins and almonds(optional) and set aside. Now fry the sliced onion in batches. Do not fry the onions all together. For a crispy texture, you must fry in batches. When done set aside. Now to the same oil/ghee, add sliced tomatoes and cook until mushy. Now add green chilies chopped, ginger garlic paste and saute until the raw smell disappears. When done, add marinated chicken pieces or chicken thighs along with required salt. Mix well and cook covered for 10 minutes over a medium flame. Do not over cook the chicken pieces. Mean while we can make the GHEE RICE. Wash the rice until the water runs clear. Drain it well and set aside. Heat ghee in another vessel or pan and add the whole spices given above. Saute it for a minute and then add the drained rice. Fry it for 5 minutes in a medium flame. To this, add salt and 3 cups of hot water (3 cups). Amount of water is taken according to the rice taken. 1 cup of rice = 1.5 cups of hot water. Mix well and add few tbsp of chicken masala gravy for a fine taste. Bring the flame to simmer and cook until the water is fully absorbed and the rice is cooked. Now to the chicken gravy- add chili powder, coriander powder, lemon juice, curd, garam masala powder, pepper powder, half of the fried onions, 1 tsp of ghee and give a fine mix. Cook it for another 8 minutes until chicken is 80 % cooked. When done, layer the rice and chicken. This is called dum. Layer half of the cooked rice over the cooked chicken masala, sprinkle some fried onions, then some fried cashews and raisins, finally add some chopped mint leaves and coriander leaves. Spread the remaining cooked rice over it, again sprinkle some fried onions, then some fried cashews and raisins, top it with chopped mint leaves and coriander leaves. Finally, sprinkle some ghee and then some saffron mixed milk. Close the vessel tightly. Cook it for 30 - 40 minutes over a very low flame. When done, blend the chicken masala and rice together. Serve this aromatic yummy rice dish in a tray garnish with remaining fried onions, raisins, and cashews accompanied with raita, pickle, and pappad. Yummy.